Well, I have quite a few nice shots of my cats, which I could post. But when I read the word animal all I can think of is the Muppets. Betty: Love your photos, especially the ones that incorporate culture. The blue man was fabulous. Hedgehogs are adorably cute. Much more thought about in UK than in US. Wish you had a city daily photo site; we'd get by more often! Hedgies are definitely cute! Nice shot. 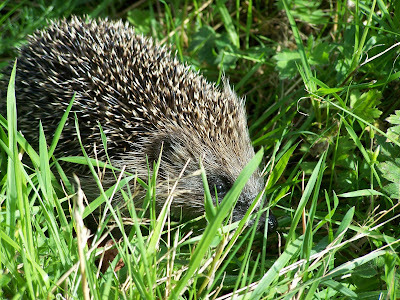 I love hedgehogs - aren't they cute? This one was quite young, I think, and was way too busy looking for lunch to bother about us.